I have saved a few of my daughters’ childhood toys and gradually unpacked some for my grandsons to play with when they visit. 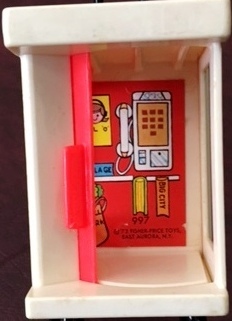 The toys are forty years old and it’s amusing to see how things have changed over the years. When my grandson picked one of the toys from a box and moved it to the small toy house, I asked, “What’s that?” curious to hear his answer. “That’s a refrigerator.” He confidently replied. “Well, it looks like one, but it’s actually a phone booth.” I pointed to the phone, but decided further explanation would go over his head. He continued to play. What a lesson from a three-year-old. We often mistake one thing for another too, and we do it with confidence. We mistake things that don’t matter and think they do. Today, a friend told me she has to clear her calendar and drive to Virginia to be with her sister whose husband is in hospice. She had a full week planned with activities and afraid of letting some people down, but knew she had to adjust and be with her sister. That mattered. Last week, a beautifully decorated luncheon table for eight, was changed to accommodate last minute additions to twelve. The table settings were mismatched and the centerpiece removed, but hospitality and people mattered over things and appearance. We may insist on our way and our opinion, and a relationship is shattered. In today’s culture, we carry our personal phone booth as a wardrobe accessory and use it while we’re in the presence of others, ignoring the people we are with. My three year old confidently identified an object incorrectly and didn’t want an explanation. Sometimes we don’t want information either. We choose the good or the easy over the best or the difficult pursuit; or we choose things over people, and we confidently forget what matters. How do you determine what matters? Share your comments with us. If you want to receive weekly blog posts, please sign up at the top right of this page. You have no idea how timely your words are to me, Marilyn – but God does. Thank you for sharing these words of wisdom. Bob's quote really hit home, too. Blessings, friend! Love your new site! It's so easy to let the urgent get in the way of the important. Building spiritual disciplines into the rhythm of my life helps me keep things in perspective. Thank you for entering the conversation, Leigh. I agree-the spiritual disciplines of prayer and a timely message in my Bible reading, when part of planning and decision making definitely gives perspective. Marilyn, loved this post! With life so busy these days, it's easy to get distracted and misplace priorities. Thanks for reminding me to focus on what matters, not what's screaming for my time and attention. Thanks for your comment, Crickett.